From Limbs & Needles Magazine Summer 2002 edition. These articles are used with permission from the NC Christmas Tree Association. WNC Community Development Association, Inc. 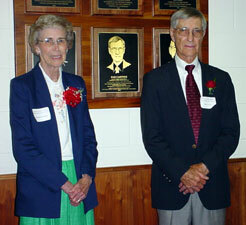 The WNC Community Development Association has announced that two people have been selected for induction into the WNC Agricultural Hall of Fame. Sam Cartner, retired Avery County Extension Agent and pioneer in the Christmas tree industry, and James R. (Jim) Edwards, retired superintendent of the Mountain Research Station in Waynesville. Sam Cartner worked with the Ashe and Madison counties Extension Service in the early years of his career but settled in Avery County with his family in 1949. Over the years, Sam worked hard to help small farmers in the mountain area grow small acreages of certified Irish potatoes, burley tobacco, snap beans, and cabbage. Eventually, he began to look for another crop that would yield a greater return for the farm family, as well as being a product that would be conducive to high mountain climate with its short growing seasons and harsh winters. Cartner worked with North Carolina State University in “on farm tests” and demonstration plots to show the application of new knowledge in Christmas tree production. This continued over the years along with integrated pest management (IPM) for control of insects, diseases, and other pests in an economical and environmentally safe manner. Cartner helped organize the North Carolina Christmas Tree Growers Association (now NCCTA) in 1959. During that time, he assisted in the establishment of one of the first larger Fraser fir tree plantations planted and harvested exclusively as cut Christmas trees. In addition, Cartner was instrumental in the organization of the Avery County Farm Bureau. Over the years of his career, he also worked with youth who were involved in 4-H Clubs and helped them learn best practices for planting and caring for Fraser fir seedlings for their 4-H projects. The WNC Agricultural Hall of Fame was established by the board of directors of the WNC Community Development Association in 1991 and this year’s induction will bring the total membership to 34. 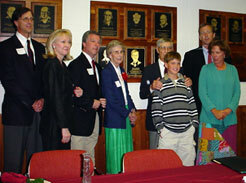 The purpose of the Hall of Fame is to identify and honor significant contributions to agriculture and to recognize those individuals who have been responsible for advancement, improvement, or promotion of agriculture as a result of their work with the agricultural community in any phase of agriculture or agri-related endeavors. The ceremony was held on Tuesday, May 14, 2002 at the Mountain Horticultural Crops Research and Extension Center in Fletcher.